When you have superficial collaboration processes, you disappoint clients, over the long haul. Hey, there is no way that I can make that statement pretty. So, let’s explore, shall we? For starters, your leaders, managers and employees initially convince themselves that they are collaborative. Simply by using the term “collaboration” over and over again, during internal conversations. Then, the more frequently you “talk” about collaboration with clients, you continue to convince yourselves that clients believe your organization has a collaboration culture. However, talking the collaboration talk to clients may consistently fall short of the client experience of how well you walk that collaboration walk. What an organization says to clients (often literally) really should match up with what an organization does on behalf of clients, wouldn’t you say? Otherwise, over time, clients realize that collaboration fantasy does not match up with reality. Your organization’s collaboration talk only is a veneer covering up a legacy, non-collaborative culture. Is your organization or association looking for a dynamic and innovative speaker for your next event? Isn’t it time to move one millimeter outside of your current comfort level and create a truly collaborative culture? Click here to learn more about my One Millimeter Mindset workshops and speaking programs. Realistically, is your own organization fostering a culture of superficial collaboration or are you focused on creating a living, breathing collaboration culture? I have worked with far too many organizations who boast about being collaborative when, upon observation, everyone is comfortably ensconced creating output within departmental silos. They tell customers about how everyone is one big team. Yet, over time, it becomes obvious to clients that team members do not share information across these silos. As a result, client outcomes fall short because the team is a team in name only. Deliverables are sufficient, but not as robust, flexible or enduring as they could be. Ultimately, superficial collaboration impedes your organization from being proactive and anticipatory on behalf of clients. Truly collaborative corporate cultures share information across the organization. The data is freed, as is anecdotal information. Not only that. Colleagues share industry trends and compare respective professional insights. As a result, leaders, managers and employees meet with each other regularly. They continuously collaborate. They toss out Yesterday’s mindset and practices, which only revolve around creating isolated output and working in a departmental vacuum. As a result, everyone’s contributions become better and better. The biggest outcome contributing to customer success just might be your organization’s vibrant collaboration culture. Think about it. 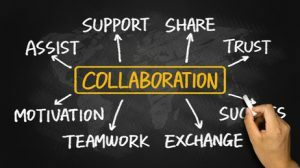 Where does your organization stand, when it comes to collaboration? Start moving one millimeter forward, today.